While being "stranded" in south Florida, the beverage of choice seems to always involve rum. Back home in Virginia, this spirit usually takes a backseat to single barrel bourbons and scotch; but in a more tropical climate - rum is King. I can't even imagine sipping an aged bourbon or scotch during the midday heat - but rum; no problemo. Whether aged or white - the taste of fermented molasses or sugar cane juice blends in with the environment . 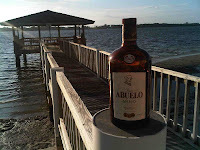 And one that I've really come to enjoy is the Añejo from Ron Abuelo. The run is crafted by the Varela-Hermanos, a 3rd-generation Panamanian family distillery. This is one of only a few distilleries in the world which grows their own sugar cane. The Añejo is made from fermented sugarcane juice and then aged in white oak barrels. It is delicious and smooth - little to no burn - perfect neat. I look forward to one day graduating to the 7 year and 12 year old products. Santa Rosa, California (May 28, 2010) — Final results, including Best of Category winners and the Riesling Champion, were announced today for the 34th International Eastern Wine Competition (IEWC). The judging was held May 19–21 in Watkins Glen, New York. The IEWC is produced by Vineyard & Winery Management magazine, and is one of the oldest and largest professional wine competitions in the United States. Complete results with links to many winery web sites may be found at www.vwm-online.com (via Wine Competitions > International Eastern Wine Competition > Results). Judges awarded 1,144 medals (44 Double Gold, 151 Gold, 399 Silver and 558 Bronze) from a field of 1,600 entries that were submitted by wineries in 37 American states and three Canadian provinces (British Columbia, Ontario and Quebec) as well as the countries of Argentina, Australia, Chile, Germany, Italy, New Zealand, South Africa and Spain. Entries were evaluated by an experienced group of professional wine judges with backgrounds in wine marketing, education and media, enology, viticulture, food and beverage, hospitality and tourism. The four Best of Category winners were selected from the 44 Double Gold medalists that advanced to the final round after earning unanimous gold votes from judging panels in the previous “medal round”. The Riesling Championship is a subsidiary of the IEWC: all Rieslings entered in the IEWC are also judged in one of four sweetness grades from dry to sweet; Best of Class winners are determined in each sweetness grade; the four Best of Class winners compete for the Riesling Championship. There were 171 Rieslings entered in this year’s competition. "Riesling Championship entries were up significantly this year,” said Leahy, “with finalists from Colorado, Michigan, New Mexico and Washington as well as the Finger Lakes of New York which won three of four Best of Class awards. “Kudos to Dr. Frank Vineyards in the Finger Lakes for ‘triple crown’ victories with their bunch select late harvest riesling taking home Best of Class Sweet Riesling and overall champion in the Riesling Championship as well as Best Dessert Wine in the IEWC. This German trockenbeerenauslese style is more labor-intensive than the popular icewine style, and acknowledges Dr. Konstantin Frank's making of the first American riesling in this style in 1962." Vineyard & Winery Services, Inc. publishes the leading independent wine trade publication Vineyard & Winery Management magazine (www.vwm-online.com) and Winedex (Wine Industry Index). Based in Santa Rosa, California, the multimedia corporation also produces seminars, conferences and trade shows (Wineries Unlimited, Midwest Grape and Wine Conference, Tasting Room Profitability, Wine Club Summit, and Managing the Winery Laboratory) as well as three wine competitions (Grand Harvest Awards, International Eastern Wine Competition, and West Coast Wine Competition). There has been an evolving movement across America to "Drink Local" that has been advocated by several bloggers and wine writers for the past decade. Supporters of this movement have highlighted and advocated wine, beer, and spirits produced in local areas. For instance, wine is produced in all 50 states, whether its ChokeCherry wine in South Dakota, Elderberry wine in Kansas, Frontenac in Minnesota, Muscadine wine from the southeast or Guava wine from more tropical climates. More importantly world class wine is being produced outside of the big three (California, Oregon, and Washington) - particularly in pockets concentrating on specific varietal wines. I am referring to Riesling in New York's Finger Lakes along with Merlot from Long Island, Viognier from Virginia, and Norton from the Midwest. 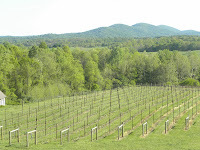 Other wine regions are catching up, including to the Yadkin Valley in North Carolina, the Grand Valley in Colorado, and the Texas Hill Country. Some may quibble with this list and there are probably other regions that should be included but the general point is that there is fine wine being produced throughout the United States - not just in California, Oregon, and Washington. Currently, however, the use of the term "Drink Local" is becoming more ambiguous. I believe the term is still a general concept, where wine consumers should include wine, beer, and spirits made in all 50 states in their general beverage consumption. Yea, its not exactly drink local, but its supporting small family wineries. And as consumers and critics we shouldn't frown upon wine made from non-vinifera grapes. If a climate can only support hybrids, or labrusca, or muscadine, or berries, or tropical fruits; then so be it. Wineries should make wine from fruit that excels in that climate and as consumers we should support that concept. Other wine writers have a slightly different definition of "Drink Local". The founders of DrinkLocalWine.com are determined to highlight the fact that world class wine is being produced outside of the big three and how this fact is generally overlooked by the national wine media as well as in restaurants. 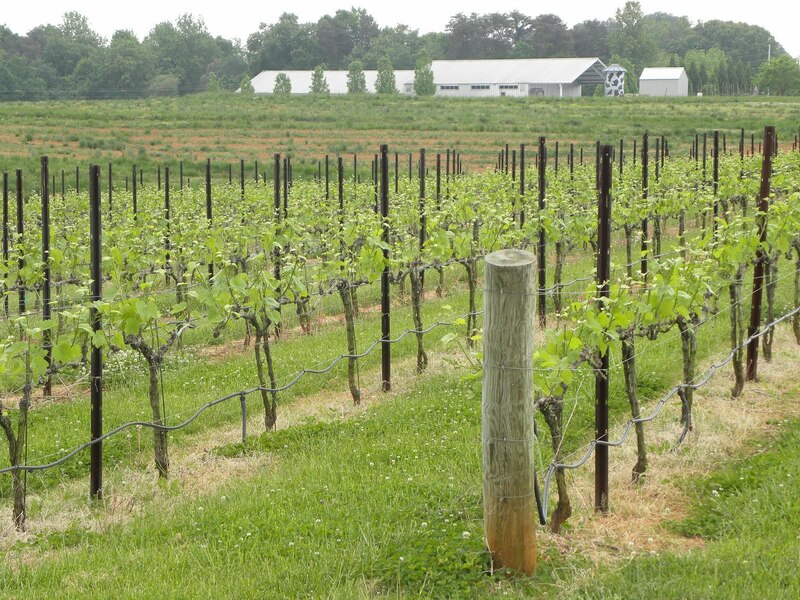 Some refer to "Drink Local" as wine produced from grapes grown within a particular state's boundary. Others prefer to use a regional model since a winery located in one state may be closer to a vineyard located in a neighboring state as compared to vineyards located in the extreme opposite corner of that state. I've even heard the term used to define wine produced from only estate grown grapes. Obviously the use of the term has become very arbitrary and subjective and we have no problems with its multi-use. It does seem to be in the Eye of the Beholder. We do however encourage wine writers and bloggers to actually define their definition of "Drink Local" in order to not confuse their readers - particularly when one claims to "just drink local". There is one topic that I believe consumers, bloggers, and critics would agree upon and that is the honest labeling of wine. If a winery produces a wine from grapes grown just within its own state's borders, or within an AVA, or within the winery's estate vineyard; then that fact should be clearly illustrated on the label. 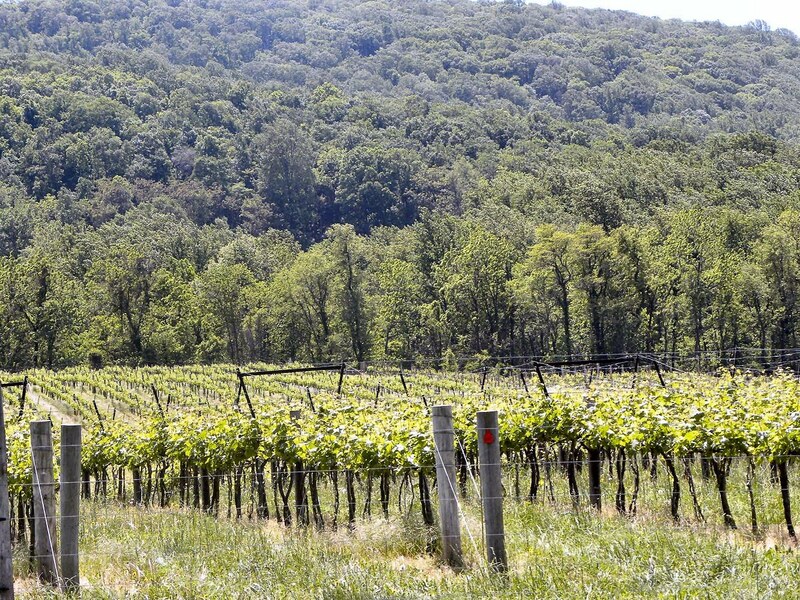 Furthermore, we applaud efforts by Corcoran Vineyards, Delaplane Cellars and other wineries that place the name of the local vineyard directly on the label when that wine is produced solely from vineyard designate grapes. That's how a region gains respect. 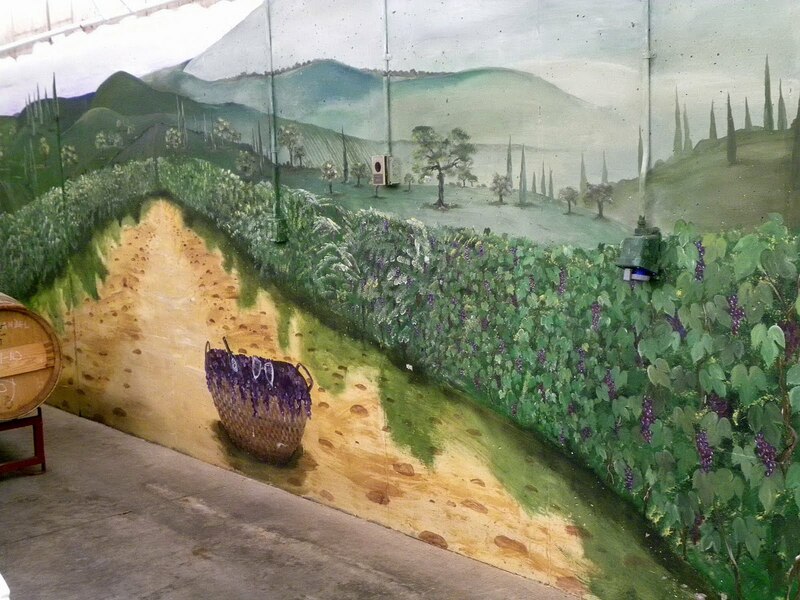 On the other hand, there are many instances when a winery produces wine from out of state grapes - particularly from inexpensive California juice. This could be a long term strategy or a temporary solution for new wineries waiting for their estate grapes to mature. Regardless, the wine's label should clearly reflect the area where the grapes were sourced - whether California, the Finger Lakes, or even abroad. Now go out and drink your definition of "local" wine. 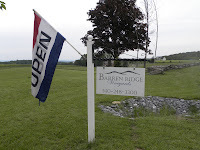 We starting our summer travels by traveling down the Shenandoah Valley in order to visit a winery that has been in our radar for quite some time: Barren Ridge Vineyards. We were most familiar with the winery, not because of their wines, but because they offer live music the third Friday of every month and tonight Jimmy O was scheduled. That led to a visit. 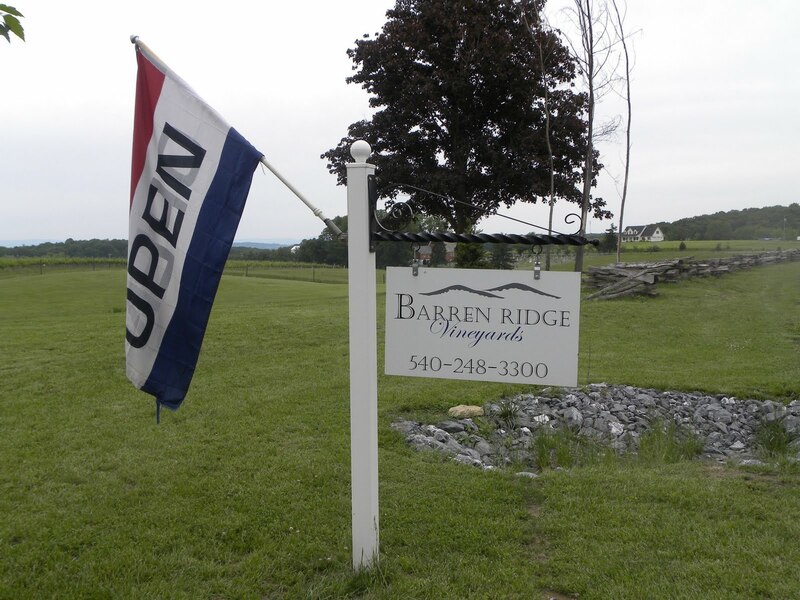 Barren Ridge Vineyards is the result of John and Shelby Higgs salvaging the Higgs family apple orchard. While living in Switzerland, Mr. Higgs experienced the European wine tradition firsthand and wanted to translate that culture to Augusta County. In 2007 friends and family planted vinifera vines and local contractors restored the decaying apple barn into a modern winery and tasting facility. Currently their wines are being made from grapes grown in neighboring vineyards until the estate vines mature. But they provide quite a selection. We started out with a dry Vidal which was quite frankly - a nice change from the usual semi-dry to sweet Vidal. It had a nice citrus flavor and decent acidity - this is probably a popular option. But what I liked best about their other single varietal wines is that they were exactly what you would expect from that grape variety. 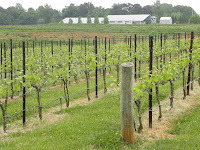 The Chardonnay, Traminette Viognier, Cabernet Franc were what one would expect from a Virginia version of these varietals. Really liked the cab franc. Same with their full bodied Petit Verdot - this is a big wine - maybe even bigger than their Meritage; but right on. Evidently the grapes benefited from a late frost and then an unusually dry, hot summer - resulting in lower yields and concentrated flavors. This is a nice wine. It was also a nice surprise that they craft a single varietal Touriga - we are always looking for something different - and if we weren't going to be in a car for a long period - this wine would have come along. Instead we choose the Traminette for our semi-dry loving relatives. Besides these single varieties, the winery produces rather unique blends - actually one of each - a red, white and rosé. The Meritage is their most accomplished having received a Gold medal at the 2009 Virginia State Fair. It is a blend of the three traditional Bordeaux grapes and priced at $25 - a decent value. Another good value at $15 is the white Tinkling Spring, a blend of four grapes. It is made off-dry - but with plenty of acidity to offset that character. Finally we have to applaud their Dry Rosé - not only for the results, but for the effort involved in crafting this wine. Juice from 5 grapes (Touriga, Merlot, Petit Verdot, Cabernet Franc, Chambourcin) are bled from the skins - then fermented. The result is a strawberry flavored dry wine - perfect for summer nights listening to music on their patio. Well done. We will most definitely return to listen to good music and good wine. Here is more analysis and news on H.R. 5034; many courtesy of Stop H.R. 5034. Rob McKenna of Washington and Vice President of the National Association of Attorneys General corrects the wholesalers' false claims of his views on H.R. 5034 here. H.R. 5034 signed on 9 more Co-sponsors, bring the total to 94 Co-sponsors. Click to email them? The Wine Institute and Wine America issued a joint statement today condemning H.R. 5034 as a “Wholesaler Monopoly Protection Bill”. The joint statement is written on behalf of 6,000 U.S. wineries. The Associated Press examines H.R. 5034. Charlotteville News & Arts calls alcohol wholesalers’ H.R. 5034 a “Naked attempt to protect their own monopoly”. 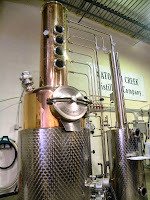 This past Saturday (May 8th) we visited Catoctin Creek Distilling Company, Loudoun County's first family-owned distillery since prohibition, to witness a bottling day. Becky and Scott Harris had recruited about a dozen volunteers to manage the bottler, cap, label, and stock cases of Catoctin Creek Organic Roundstone Rye. This whisky is made from 100% organically grown rye - no neutral spirits added - and aged in oak barrels. 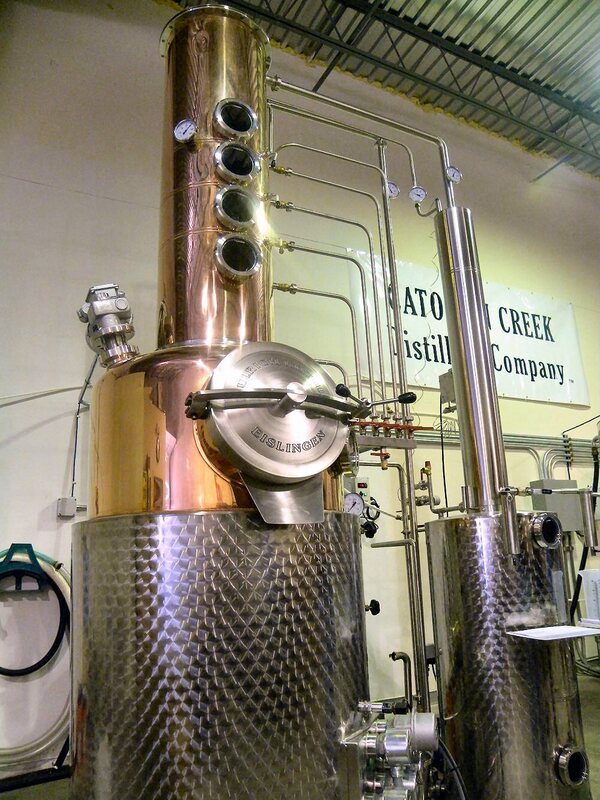 They also bottle the distilled rye without barrel aging under the Catoctin Creek Organic Mosby's Spirit label. This spirit was just awarded a bronze medal in the American Distilling Institute 2010 Whiskey Competition in Louisville, KY. Thus the underlying spirit in the Roundstone Rye has already proved itself - an oak aged version should only be better. 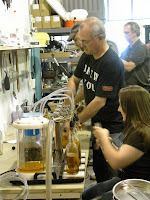 The bottling operation looked quite efficient - even for a 100% manual process. 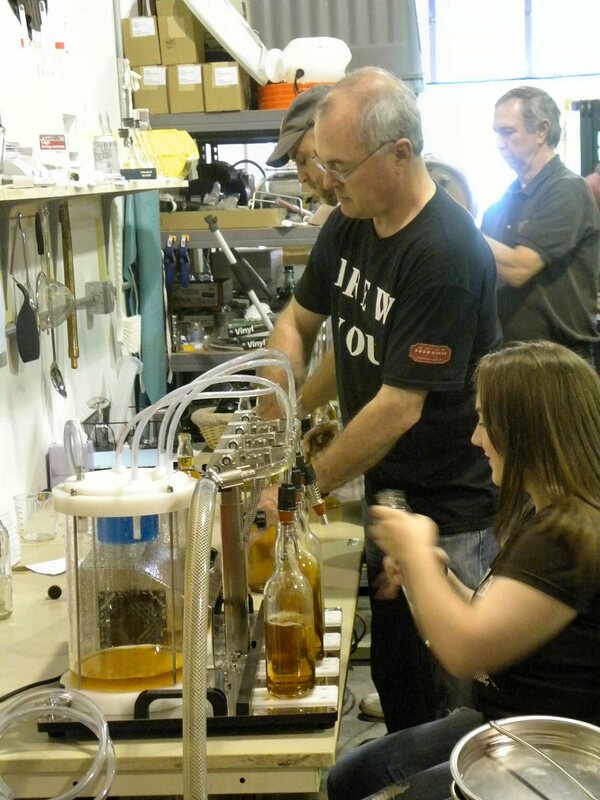 The assembly line was in full capacity - someone passing empty bottles to a filler, then to a capper, then to the labeling table. Here the batch number were written on the labels by hand and after applied to a bottle, inserted into a case - with its own label. Not bad for a group of volunteers. 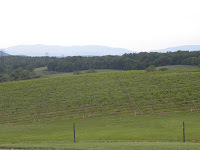 After watching the process, we ventured to a few wineries outside of Purcellville on Route 9. 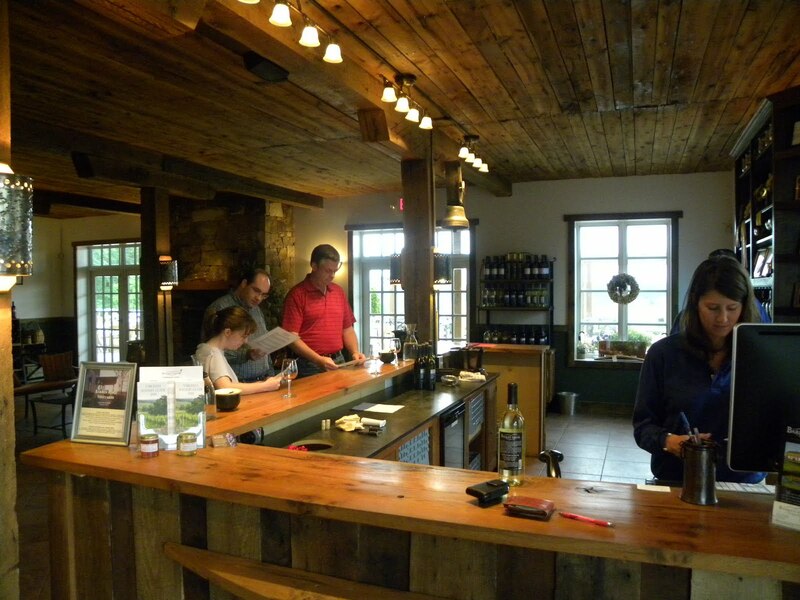 Our first stop was Breaux Vineyards - which we haven't visited in a few years. Their 2002 Reserve Merlot was selected as the top overall wine poured at the DrinkLocalWine.com Twitter Taste-off last month - so why not a re-taste. Not so fast. This is a popular location - at noon the tasting room was packed - two to three people deep. Nice to see the traffic - but right now... Instead we walked around the vineyard and admired the vineyards against the mountains. Our next stop was Hunter's Run in Hamilton, which is a joint operation with Corcoran Vineyards. 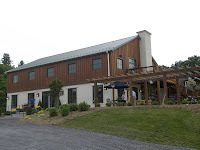 Without having to wind through the gravel roads leading to the winery, the Hunter's Run Barn provides a location to taste the wines - right off of Route 9. Plus they host live music on weekends. Today Lenny Burridge was in the barn - wanted to see him for a long time. 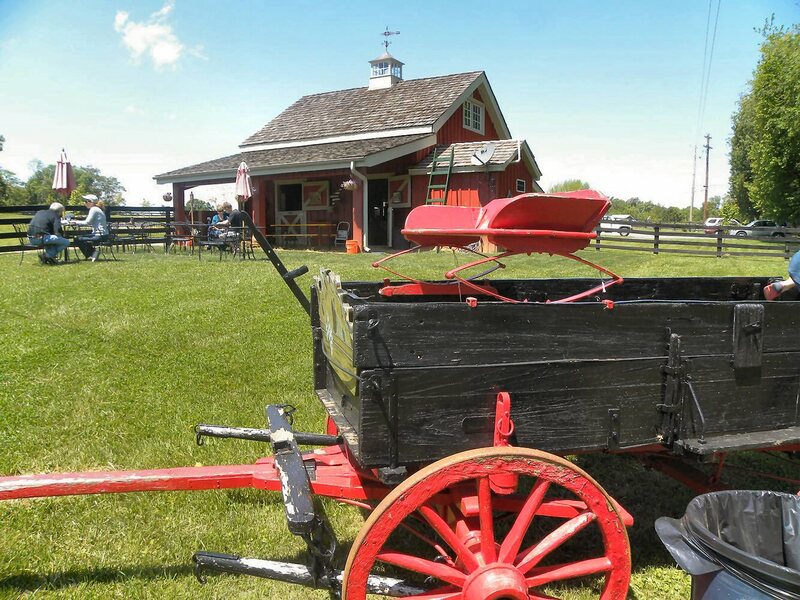 Hunter's Run is a great location for families bringing their kids along. The upstairs loft contains toys and games that will keep them entertained while parents frequent the tasting bar. The only downside; the Corcoran Viognier is out of stock. Need to find another outdoor alternative. Our final stop was Village Winery in historic Waterford. For some reason I had a craving for their Apple Wine. I don't know why because in general I prefer their Viognier and Petit Verdot. But the Apple Wine is made dry and sometimes you just need something different. Plus they offer a non-alcoholic sparkling Elderberry which the little boy is now asking why we didn't bring home a case. Kent Marrs has really turned into one of our favorite winemakers - always crafting a consistent product. We need to return more often. House Resolution 5034 is a contemptible piece of special interest legislation that would harm small, family wineries, harm specialty wine stores, kill jobs and prevent consumers from legally accessing wines they can’t find locally by leading to bans on the legal, well regulated direct shipment of wine. Learn about the legislation, who supports it, who opposes it, and how it’s being covered in the media. GET EDUCATED and Help STOP HR 5034. And over 10,000 people have become fans of STOPHR5034 on Facebook. Are you one? 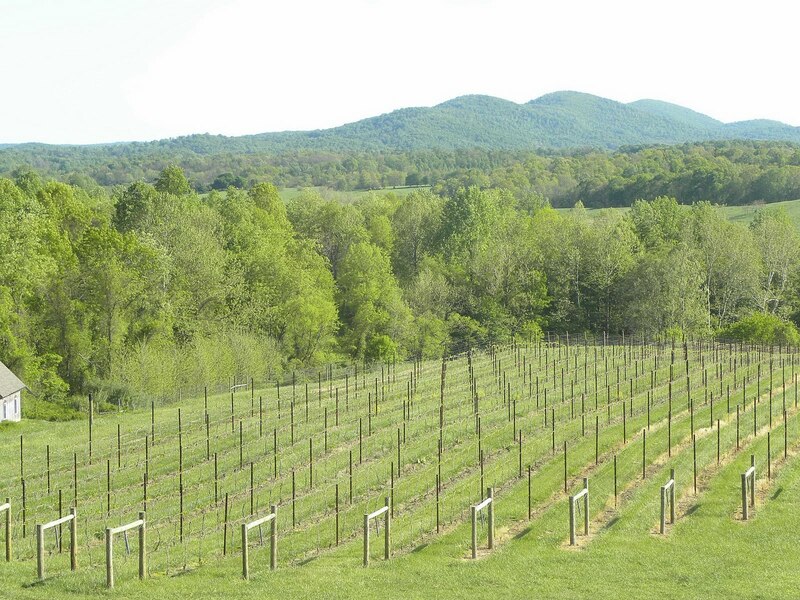 Its difficult spending three days in the Yadkin Valley without visiting a winery and that's usually the case during Merlefest. 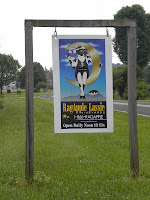 However, on Sunday morning I ventured only a half dozen miles from my hotel room to visit one of the most popular in the region: RagApple Lassie Vineyards. I first heard of the winery several years back when I read that their 2003 was awarded the Governor's Cup at the 2004 NC State Fair. 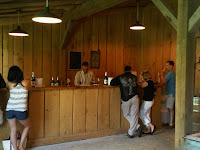 I purchased a couple bottles of that wine as well as their Viognier and as I recall we enjoyed both wines. 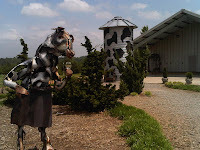 I'm also familiar with the winery through MyJoog.com since they host live music almost every weekend. I felt fortunate that Booneville was so close to Elkin. 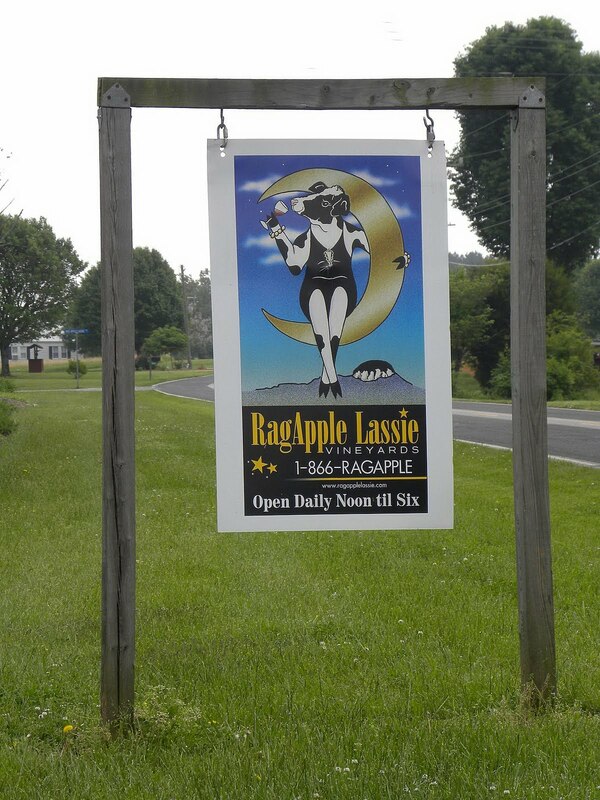 RagApple Lassie is owned and operated by Lenna and Frank Hobson, who is the third generation of Hobsons to till the land - tobacco, corn, wheat, and soybeans. 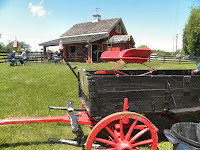 However, with the declining value in tobacco (the allotment for each farm has been reduced by 53 percent) he always feared that the land would lose its profitability and be sold and converted into a housing development. To avoid this scenario he planted a vineyard in 2000 - which lead the family to construct the winery two years later. They choose RagApple Lassie in honor of his pet Holstein, a calf that he received as a child and together they would later win the Grand Championship Trophy at the 1957 NC State Fair. I'm sure it never occurred to the family that 46 years later he would receive a wine award at the State Fair. Since the Hopsons were professional farmers and not winemakers, they prudently hired Linda King - already an award winning winemaker and internationally certified wine judge - who was seeking to relocate to the area. A nice coincidence. Thus a team evolved where Frank Hobson meticulously worked the vineyards, Linda King meticulously vinified these grapes, and Lenna Hobson used her marketing experience to sell the wine. The most interesting aspect when visiting the winery is that you enter the winery on a catwalk overlooking the fermenting tanks. And to reach the tasting room, you must traverse the tank room - regardless what tasks are underway. They may be pumping wine or juice, crushing, pushing the fruit down, cleaning - yet that's where you travel to taste the wines. You basically start with a tour. Then to the wines. 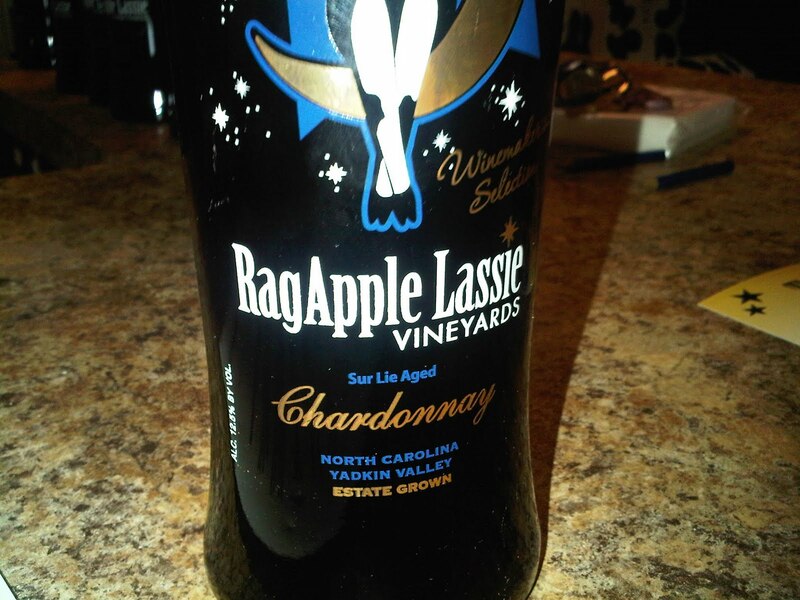 RagApple Lassie crafts a dozen different wines, all made from estate grown grapes. In fact they grow 15 varieties, many you wouldn't expect from a North Carolina grower: Marsanne, Semillion, and Zinfandel. But why not, when you have plenty of land and know how to grow anything. As expected their portfolio range from dry to sweet, but even the sweet wines were not syrupy and gritty - they were actually quite drinkable particularly the Rockford Red. This concoction is a blend of classic Bordeaux grapes plus Zinfandel sugar coated to 4% r.s. . Yet it has a nice acidity that works with blue cheese. Supposedly many dry wine drinkers add a bottle of Rockford Red during checkout, claiming to buy this for a friend. Sticking to the sweeter wines, the "First Blush" is a popular wine in that market and has a very interesting makeup - Traminette, Marsanne, Semillon, and Malbec - who thought of that blend. The Boonville Blanc is 100% semi-dry Viognier that was basically a sweeter version of their dry version. But the one sweeter wine that I enjoyed was the off-dry Kaleidoscope Gold. The composition of this wine was a result of the Easter Freeze that left the winery short on several varieties. Thus they blended them together - Chardonnay, Traminette, Pinot Gris, Marsanne, Semillon, and Viognier. The danger of blending many varietals is that it could produce a big tank of nothing - flavors and aromas that counteract each other. But this blend works - and I came home with a bottle. Staying with whites, I really enjoyed the Chardonnay and Viognier. Ms. King has really perfected this wine, barrel fermented sur lie - it is not over powering but has a nice mid-palette that slides into a soft tail. And for $16, this is a great value. The Viognier is not as big as the Virginia Viognier I'm used to, but this one has all the characteristics in aroma and flavor, plus a hint of spice at the finish. As the price of Virginia Viognier continue to skyrocket, this is a nice everyday alternative. 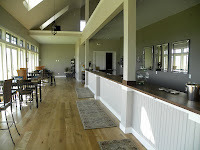 Moving to reds, the winery offers three 100% varietals (Cabernet Sauvignon, Syrah, and a Zinfandel) and one reserve blend, The Hobson's Choice. The varietals were all nice, smooth and very drinkable - but were easily overshadowed after tasting the reserve blend and hearing its story. In 2005 Mr. Hobson watched over a lot in the vineyard which was producing excellent fruit. He hectored Ms. King to allow him to pick the fruit because he felt they would produce an exceptional wine. The winemaker initially refused but Hobson's persistence eventually wore her down. The Zinfandel, Cabernet Sauvignon, and Pinot Gris grapes were harvested together, mixed into the same bins, pressed together, fermented together and aged together. They have no idea the ratios. After aging one year in barrel, Ms. King tasted and claimed that the wine would have to be dumped. After the second year, she said the wine was changing and after the third year she exclaimed it was special. Hobson's Choice - there really was no choice. The wine is special; its big, but silky smooth. Some cherry flavors, some chocolate and nicely balanced between fruit and oak. Just thinking about it made me realize I should have purchased another bottle. Particularly since this wine will never come again. At some point I need to return to the Yadkin Valley during a non-Merlefest weekend. 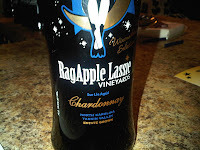 When that happens RagApple Lassie will be on the itinerary - this time in the evening to enjoy good music and good wine. After the 2010 DrinkLocalWine.com two fellow bloggers, MyVineSpot and Anything Wine visited Delaplane Cellars and enjoyed their stay. A few days later I had a chance to follow their footsteps and caught the winery just before closing. Fortunately the Jim and Betsy Dolphin were willingly to stay open a tad longer to accommodate my visit. Delaplane Cellars is an infant, having opened officially this year. However, Jim Dolphin has been making wine and studying viticulture and vinification for years, even studying under esteemed winemaker Jim Law of Linden Vineyards and taking oenology courses through U.C. Davis. 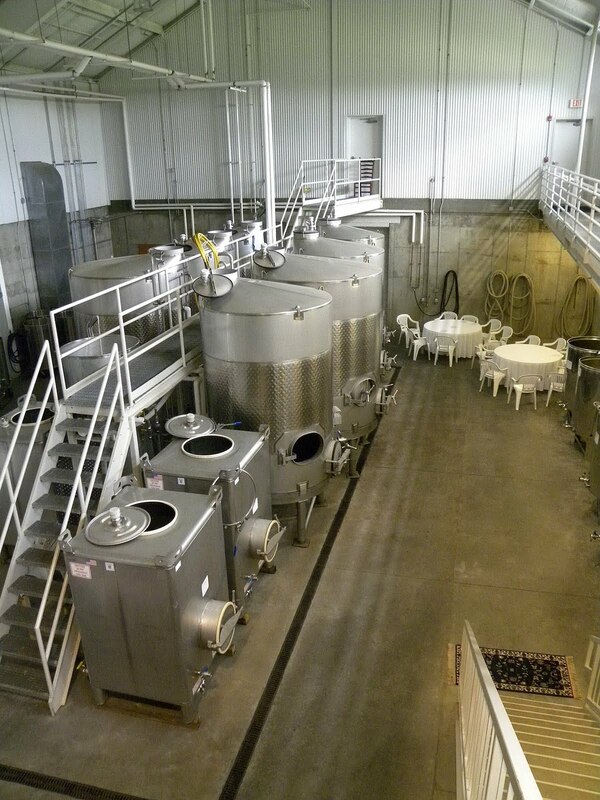 Thus, he didn't have to rely on other winemakers to solely craft his initial batch - he was able to borrow different facilities to craft his wine style while the winery was being constructed. No slapping another wineries product with a different label here. 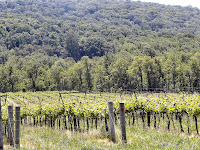 The winery and estate is located in the scenic Crooked Run Valley. 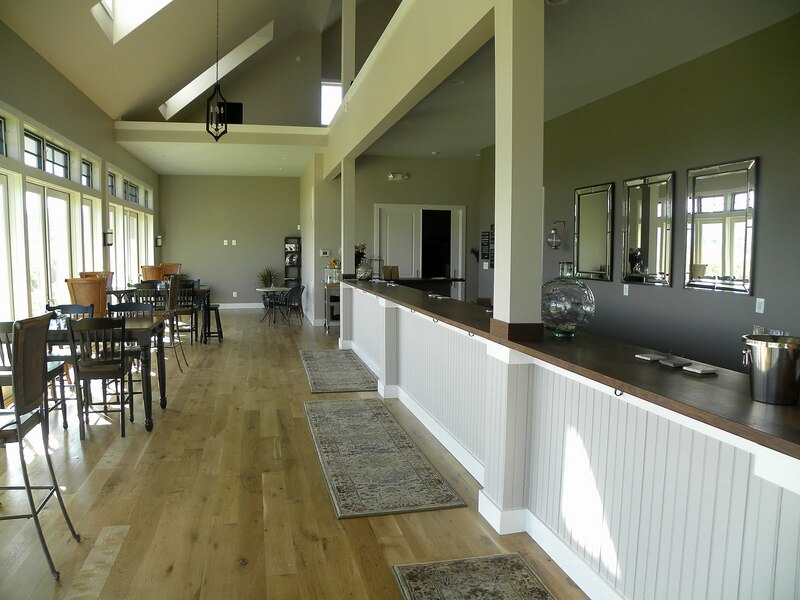 The tasting room\winery building was constructed to match the Sporting Library in nearby Middleburg, but that fact is quickly forgotten once you witness the panoramic scenery from the tasting room. The view is simply amazing as the valley stretches out from their vineyards to the Cobbler Mountains in the distance. The winery's label characterizes that mountain range. And the Dolphin's never tire of that view. The estate is planted with traditional varieties that excel in the Commonwealth; Cabernet Franc, Petit Verdot, Malbec, Tannat, Merlot; as well as Cabernet Sauvignon and Petit Menseng. Until the vineyard comes of age, their fruit is sourced from several highly regarded vineyards. In fact, the winery is so proud to be associated with these vineyards, that the vineyard name is used in the wine's name whenever possible. We applaud this designation, great wine starts with good fruit, and vineyards that provide these should be getting the appropriate accolades. Delaplane Cellars offers a solid portfolio of wines, yet one of my favorites wasn't even one of theirs. It was the Glen Manor Sauvignon Blanc which the winery provides to round out their portfolio. Winemaker Jeff White has crafted a winner here. 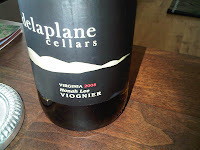 Delaplane specializes in Viognier and I was able to sample three: 2008 Honah Lee Viognier, 2008 Maggies Vineyard Viognier, and the 2007 Emerald Lake Viognier. Each of the wines are aged in neutral French oak barrels which provide a fuller mouthful all the while trying to maintain a balance between the fruit and oak. These are all nice wines, but I am still not sold on oaked Viognier; for my palate, I enjoy those imprisoned in stainless steel. On the other hand, I had no issues with their red portfolio, unless you include their Pink Rose, which is a 3% r.s. concocted for a particular audience. But their dry reds are memorable. Their 2007 Old World Cab Franc contains a small amount of Syrah and Cabernet Sauvignon, but the fruitiness of the Cabernet Franc is prevalent - assisted by a nice acidic finish. This is a nice example of a medium bodied Cab Franc - typical cherry with some plum flavors and a smooth finish. Their 2007 Left Bank Bordeaux Blend is fuller and consists of 67% Cabernet Sauvignon (Tranquility Vineyards), 29% Merlot (Bella Luna Vineyard) and 4% Petit Verdot (Springlot Vineyard). The nose to this wine is almost overpowering; it then eases into a nice blackberry mid palette and then a pepper finish. Nice. During one conversation at the DrinkLocalWine.com we discussed how winemakers love Syrah, but in general, the public doesn't know enough about the varietal to constantly purchase it. Well, here's another worthy example made in the Northern Rhone style that includes a small dose of Viognier to soften the wine. This wine is toasty and earthy - an old world wine crafted in the new world. Yet the best was still to come in their 2007 Springlot Reserve Single Vineyard - a classic Bordeaux blend of CF, CS, Merlot, and Petit Verdot. The fruit comes from Springlot Vineyard, a two acre lot of granite based soil located at 1200 feet above sea level and meticulously maintained by John Everson. A perfect storm of soil, elevation, and vineyard management. Plus the grapes were harvested in 2007, the closest year that Virginia gets to the average California season. The result is a dark fruit flavor, velvet mid palette and smooth finish. This wine may be priced a little high for the average consumer ($40), but its worth every cent. I wish I good of extended my stay and enjoyed a glass of one of these reds, but I had already overstayed my visit. 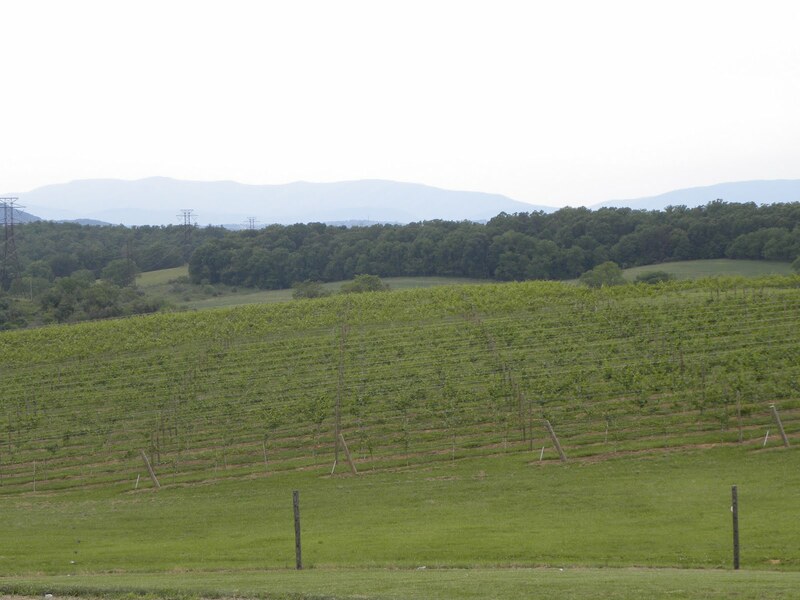 Regardless of what brings me out Route 66, a visit to Delaplane Cellars is on the agenda. A fabulous view and nice wines, what more do you need?